Follows on from Popular Names for Girls. William is a solidly classic name which has never left the Top 50. It was the #1 name of the 1900s, and gradually decreased in popularity, hitting its lowest point during the 1970s, at #48. 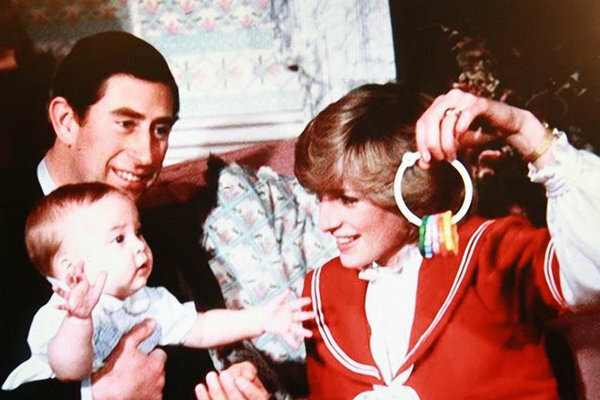 However, its fortunes were soon to recover, because in 1982, heir to the British throne Prince Philip, and his then wife, Diana, Princess of Wales, welcomed their first child and eldest son, William Arthur Philip Louis. Prince William was named after his father’s cousin and personal hero, Prince William of Gloucester, who died in an air crash ten years earlier. Prince William made his first visit to Australia as a baby, and this was an immediate help to the name’s popularity. By the time Prince William began university in 2001, the name was already in the NSW Top 10. It reached #1 in 2009, the year after Catherine Middleton began accompanying Prince William to official functions, and there it has remained. In 2011, Prince William made a much-appreciated visit to flood-affected areas of Australia, and shortly afterwards treated the world to a slap-up royal wedding. It’s likely this princely name will remain at the top for at least another year. Jack is a classic name which has never left the charts. Top 100 during the 1900s-30s, it sunk to its lowest point in the 1970s, at #269. However, so rapid was its growth that it joined the Top 100 again during the 1980s – the same decade that pop singer John Farnham released his Whispering Jack album. Whispering Jack went to #1, and is the highest-selling album ever in Australia, having gone platinum 24 times over. By the 1990s, Jack was already Top 10, a decade when Leonardo di Caprio played water-logged lover Jack Dawson in the romantic movie Titanic, and teen heartthrob Daniel Amalam played bad boy Jack Wilson in soapie Home and Away. By the start of the 2000s, Jack was #2. It made #1 by 2004, the year that the TV show LOST began, with its hero Dr. Jack Shephard, and the year after Johnny Depp played Captain Jack Sparrow in the first Pirates of the Caribbean film. Jack remained in first place until 2008, the year that AC/DC released their single Big Jack. Jack the Lad may have had his day, but won’t be going anywhere fast, and is still the #1 name in some states. Ethan is a name from Hebrew which means “solid, enduring”. In the Old Testament, Ethan is said to have been a very wise man who wrote Psalm 89. Ethan first entered the charts in the 1970s, and took off during the 1980s, as film-maker Ethan Coen began his career, working in tandem with his brother Joel. At the end of the 1980s, actor Ethan Hawke got his big break in Dead Poets’ Society. By the 1990s, Ethan was a Top 100 name, and it was in this decade that Tom Cruise first played Ethan Hunt, the hero of the Mission Impossible films, Ethan Philips joined the cast of TV show Star Trek, and Ethan Rayne was introduced as a character on Buffy the Vampire Slayer. It was also during the 1990s that surfing champ Wendy Botha welcomed a son named Ethan. In 2006, Ethan joined the Top 10 – the year after the Ethan Group, an Australian IT company, won the BRW Fast 100. Singer Dannii Minogue, Kylie’s sister, welcomed a son named Ethan in 2010, and that probably won’t hurt the chances of this strong yet gentle-sounding name going higher still. Oliver is the English form of French name Olivier, but it’s unclear whether it’s the Norman form of Germanic Alfher, meaning “elf warrior”, or Old Norse Aleifr, meaning “ancestor’s descendant” (related to Olaf). The spelling was altered to make it seem as if the name came from the Latin oliva, meaning “olive tree”. A classic which has never left the charts, Oliver was Top 100 in the 1900s, but then sank into rare use. It recovered during the 1970s, the decade after the release of Oliver!, the musical based on Dickens’ novel, Oliver Twist. In this decade, actress Goldie Hawn welcomed a son named Oliver. The name gained ground during the 1980s, and was Top 100 during the 1990s. Late in the ’90s, the first Harry Potter book was published, featuring Harry’s Quidditch captain, Oliver Wood. In the 2000s, the books were turned into films, with Oliver Phelps playing the role of George Weasley. By 2006, the debut of TV show Hannah Montana, where Oliver Oken is the best guy-friend of the heroine, it was Top 20, and by 2008 it was Top 10. By 2010 it was Top 5; Oliver may go higher if you want some more. Lucas is the Latin form of Greek Loukas, on which English Luke is based. Lucas first entered the charts in the 1950s. There was noticeable growth during the 1970s, the decade that George Lucas made the first Star Wars movie, and then it remained stable for several decades in the very low 100s. However, in the 2000s it made the Top 100, and at this point it fairly raced up the charts. A possible help to the name was the television drama series, One Tree Hill, in which Chad Michael Murray plays the main protagonist, Lucas Scott. This brooding, blue-eyed, sporty yet bookish hero proved something of a hit with the female demographic. Meanwhile, Lucas Holden on Australian soap Home and Away was also a literary teenager, who ended up having a controversially steamy scene with his onscreen girlfriend. By 2006, the year that soccer star Lucas Neill played for Australia in the World Cup, it was in the Top 50. By 2007 it was Top 20, and by 2010 it was Top 10. The 2000s were kind to Lucas, and at this point, lucky Lucas seems almost certain to go to #1. Noah is derived from the Hebrew name Noach, meaning “rest, comfort”. Noah is well known from the Old Testament story, where he builds an ark which saves his family and the animals of all species to survive the Great Flood, sent by God as a one-off punishment to wicked humanity. The name Noah entered the charts in the 1980s, the decade when Noah Hathaway gave an award-winning performance as boy-warrior Atreyu, in the fantasy film, The Neverending Story. Also in the 1980s, Australian actor Noah Taylor made his film debut as the main character in the critically acclaimed The Year My Voice Broke. Noah climbed steadily, then suddenly shot up during the 1990s, the decade that Boris Becker welcomed a son named Noah, so that it was in the Top 50 by the 2000s. Noah joined the Top 20 in 20005, the year after Ryan Gosling played the young version of Noah Calhoun, the devoted lover from romantic film, The Notebook. In 2006, Noah was in the Top 10. However, Noah has remained reasonably stable, with no signs of moving significantly up or down, and we must wait to see whether it sinks or swims. Lachlan is a Scottish name which began as a nickname for someone from Norway. In Scotland, Norway was known as the “the land of the lochs”, or Lochlann. Lachlan Macquarie was born in the Hebrides, and became Governor of New South Wales in 1809. To the British government of the time, Australia was a penal colony for offloading the dregs of their society; convicts must be treated cruelly, former convicts exploited, and little money spent. The government fretted as Macquarie pardoned convicts, employed freed convicts in important positions, put up beautiful Georgian buildings, and spent lavishly on public works. Eventually the British booted him, but for giving us a future and sticking up for us, he is considered the father of our nation. Lachlan has been almost continuously in the charts, only dropping out in the 1930s, but was in rare use until it began rising in the 1960s. In 1971, media magnate Rupert Murdoch chose this name for his eldest son, and the name rose significantly. It was Top 100 by the 1980s, Top 20 by the 1990s, and Top 5 by the early 2000s. The position of this patriotic favourite has been stable for more than a decade. Cooper is an English surname which means “barrel-maker”. One of the most famous rivers in Australia is Cooper Creek, where doomed explorers Burke and Wills met their end, and Australian racing car driver Jack Brabham drove for the Cooper Car Company. Cooper first entered the charts in the 1980s, and made good ground during the 1990s, a decade when Bill Murray and Hugh Hefner both welcomed sons named Cooper. By the 2001, the name was in the Top 50, and then it soared. It got some serious sporting muscle as Quade Cooper joined the national men’s rugby union team, the Wallabies, and Cooper Cronk joined the national rugby league team. Cronk was also part of the Melbourne Storm team which won five Premierships or Minor Premierships within four years. Originally from Brisbane, he plays for the Queensland state side, which insists on winning the State of Origin series every year. Handsome, athletic and an extremely talented player, Mr Cronk seems like a big part of the reason the name Cooper is #1 in Queensland. Cooper made the Top 10 in 2007, and the Top 5 the following year, but now seems to be falling without reaching the top spot. Thomas is from an Aramaic word meaning “twin”, and in the New Testament, Saint Thomas was one of the Twelve Apostles. Thomas was his nickname; his real name was Judas. Presumably he was the twin of someone in the Biblical stories, or just a lookalike or kindred soul, but frustratingly, the Bible neglects to explain whose “twin” he was. People who like logical explanations for things often cite Thomas as their favourite Apostle, because when he heard that Jesus had been resurrected, he refused to believe it until he could see and touch Jesus for himself – hence the phrase, Doubting Thomas for a sceptical person. Thomas is a classic which has never left the Top 100. In the Top 5 of the 1900s, it gradually declined, and reached its lowest point in the 1970s, at #68. It climbed smoothly through the 1980s, the decade that saw Tom Cruise and Tom Hanks become stars. By the 1990s, it was in the Top 5, and maintained position in the 2000s as Tom Felton played Draco in the Harry Potter films, making many a teen girl switch to Team Slytherin. However, it may be very gradually going down now. James is the Latinised form of Jacob, and must be one of the most successful names from the New Testament. The name of two of the apostles, this doubly saintly name is also a royal one in Britain, where there have been seven Scottish kings called James. The King James Version of the Bible was commissioned by King James I of England (James VI of Scotland), giving it yet another tie to this sacred book. In Australia, the most famous James is Captain James Cook, the explorer who discovered our continent. A classic which has never left the Top 20, James reached its lowest point in the 1960s and ’70s at #19. Recovery was so swift that it was Top 10 in the 1980s, and Top 5 in the 1990s. Since the 1970s, there have been many Jameses in the public eye, real and fictional. Actors James Woods, James Spader, James Marsters, and James Phelps; singers James Blundell, James Morrison and James Blunt (not to mention the band James); Captain James Kirk from Star Trek; and the inimitable James Bond. James is the name of Harry Potter’s father – his mum’s name Lily is also Top 10. Cool James is falling again, at glacial speed. Other than Cooper, Lachlan and Thomas these are some of my favorite male names. Classic and well worn. Unfortunately they are a bit too well worn for me to use. I know what you mean – the boy’s Top 10 seems even more popular than the girls, as several of these names have never gone out of fashion.